Since their inception in 2012, Rhythm of the 90’s have become THE band to get any party started! Armed with only 2 simple ideas, to bring the best dance hits from this seminal decade back to the masses – and to perform them FULLY LIVE! 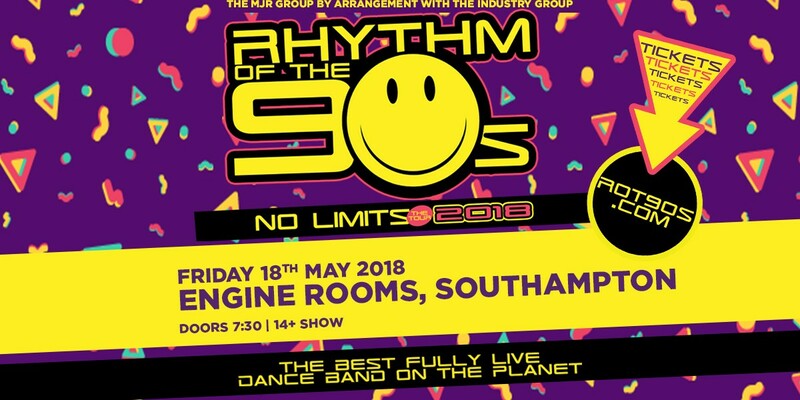 This 7 piece band have found themselves in the eye ofthe 90’s nostalgia whirlwind and this last 18 months have seen them take the UK by storm with sold out show after show across the country, culminating at Portsmouth’s Victorious Festival, where 20,000 people bounced along to all their favourite 90’s hits. With further highly acclaimed festival performances at The Isle of Wight, and Love Saves the Day in 2016, 2017 promises to be even bigger, with confirmed slots at Glastonbury, Mutiny and a main stage appearance back at Victorious Festival. The popularity of the band just keeps on growing! It’s only a matter of time before they have the whole of Europe bouncing, wearing dungarees and dusting off those shell suits.